There is a way of understanding how much modern medicine has to offer individual patients. It is a simple statistical concept called the “Number-Needed-to-Treat”, or for short the ‘NNT’. The NNT offers a measurement of the impact of a medicine or therapy by estimating the number of patients that need to be treated in order to have an impact on one person. The concept is statistical, but intuitive, for we know that not everyone is helped by a medicine or intervention — some benefit, some are harmed, and some are unaffected. The NNT tells us how many of each. Imagine for instance a fictional heart attack treatment called ‘StopAttack’. Imagine that 75 percent of heart attack victims who take StopAttack survive, but only 25 percent survive if they are not given StopAttack, as shown in the graph below. This is certainly a major reduction in deaths. But note that 25 percent of people will die whether they get StopAttack or not (the bottom of the graph) and 25 percent will survive whether they get StopAttack or not (the top). These two groups are therefore unaffected by StopAttack, and the treatment neither helped nor hurt them. For the 50 percent in the middle, however, StopAttack was life-saving. The tricky part is that for most treatments we don’t know which group a person undergoing treatment will end up in, the group that was helped, the group that was harmed, or the group that was unaffected. Therefore in order to be honest and open, so that expectations are realistic and decisions are well informed, before a treatment like StopAttack is begun we can estimate the likelihood of each one of these possibilities. Here’s how that estimation works: If we calculate how many people we need to treat with StopAttack in order for one person to be positively affected, the number is 2. This is because StopAttack positively affected (saved the lives of) 50 percent, but did not help the 25 percent who would have died, nor the 25 percent who would have survived either way. This means that “1 in 2 heart attack victims are affected by StopAttack”, or that “there’s a 50 percent chance that treatment with StopAttack will save a heart attack victim’s life.” Therefore the number of people we need to treat with StopAttack in order for us to know it affected one person is, on average, two people. In other words the NNT = 2. The NNT is an intuitive and simple way of estimating how likely it is that a treatment or medicine will help an individual person. And it turns out that the NNT for a drug or intervention is easily calculated from the results of any trial done on that drug or intervention. 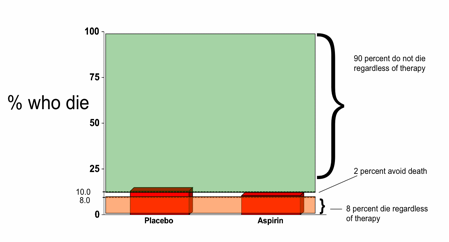 Since most drugs and interventions have been studied at some point we know and can estimate an NNT for many (if not most) of the things that we do, which means that physicians and their patients can easily determine and discuss the likelihood that a patient will be helped, or harmed, or unaffected, by a given medication or procedure. In controlled trials of medical interventions (drugs, surgeries, etc.) there is always an ‘outcome measure’, which is a researcher’s way of saying that there is always something that they are measuring to determine whether or not the intervention helped. In the above case of StopAttack, the outcome measure was mortality (i.e. death rate). StopAttack was aimed at reducing deaths from heart attacks, and in our fictional example it worked, reducing deaths by 50%, a tremendous effect. This translated into an NNT of 2, and the formal calculation for this is: 100/50 = 2. This comes from the following formula for calculating the NNT: 100/ARR = NNT. So what’s the ‘ARR’? It’s the ‘absolute risk reduction’, which means the reduction in the risk of the outcome (mortality in this case). The reduction in the risk of mortality using StopAttack was 50%. If we now imagine a scenario in which 10% of people who have untreated heart attacks die and 90% survive (this is pretty close to reality), then we’ll find a very different effect for a treatment we’ll call StopAttack2. In fact, StopAttack2 can’t be nearly as effective as StopAttack, since above StopAttack reduced death from 75% to 25% (a total of a 50% reduction) and in this scenario only 10%, or 1 out of 10 people, die without the treatment. This means that the maximum amount that StopAttack2 could possibly reduce deaths is only 10%. In other words when only 1 out of 10 people die of a disease the best you could possibly do is to save the 1 out of 10 people who were going to die. And if we were able to find a miracle treatment that could do that (take the 10% mortality rate down to 0%) this would translate into an NNT of 10. Why? Because 100/ARR = NNT, and in this case the reduction in risk is 10% (we went from 10% mortality to 0%, an absolute risk reduction, or ARR, of 10%). But let’s say that we had a third treatment, StopAttack3, which reduced death by 2%, from 10% to 8%. While this is a small number, it also represents a potentially important reduction in deaths when it is used on many people. 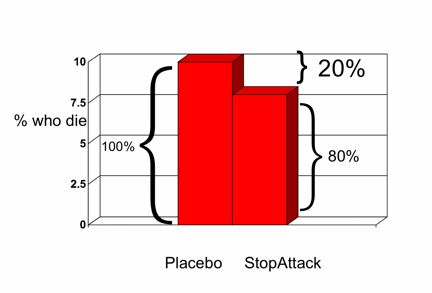 This is an ARR of 2%, which means 2 out of every 100 people are saved by using StopAttack3, for an NNT of 50. We would, on average, have to treat 50 patients for 1 patient to have been saved from death. But it does mean that, like above, there is a significant group of patients that will be treated with StopAttack3 that will be unaffected in either direction — they will either die or survive regardless of the drug. In this case 90% will survive regardless of whether they receive StopAttack3 and 8% will die regardless of their treatment. This means 98% of the patients, in total, who are subjected to it will be unaffected by StopAttack3. But there’s another way to describe what’s happening here. We could say that a reduction of 2% from an expected death rate of 10% is a “20% reduction in death”, and we would be correct, at least semantically. Here’s why: if we only concentrate on the 10% of people who die of their heart attacks we can see in the graph below that a 2% reduction is actually a 20% relative reduction in risk, RRR. In other words relative to the 10% who would normally die, if only 8% die then this is a 20% proportional reduction in death rate. The problem with this type of description is that, although it is semantically correct it is profoundly misleading. This is because before a treatment begins patients and doctors don’t know whether a patient will be helped, harmed, or unaffected by the treatment. If, in a conversation with a patient, we use the RRR to describe how likely it is that StopAttack3 will work (i.e. “StopAttack reduces your chance of dying by 20%”) then we have ignored the much greater possibility, 98% as we calculated above, that a patient will be unaffected. When we use the RRR to describe an effect of treatment we have concentrated only on the people who will die and ignored all of the people who will live. And we don’t know which group a patient will fall into until they have the treatment. Therefore using a description before the treatment that ignores the much larger chance that they will be in the group that survives regardless of the treatment (while still being subjected to the potential harms and side effects of the treatment) is very misleading. A true representation of the chances of being affected by a treatment is only apparent when we use a graph like the one below, a graph that shows us everyone (rather than just those may die). One can see how using the RRR to describe the potential effect of a treatment would be enticing, particularly if someone wanted to exaggerate the potential benefit of a treatment. For StopAttack3 the RRR was 20% while the ARR was 2%, a ten-fold difference. Therefore people and groups that are trying to emphasize beneficial effects (groups that have a profit motive, doctors that are attempting to sway a patient in one direction, etc.). This is where the NNT becomes most valuable: as a tool to standardize communication. The NNT only uses the ARR and therefore when patients and doctors use the NNT there is no deception or exaggeration of impact. The concept of the NNT is highly intuitive, and once trained in its use, easy for most to understand. The core value of the NNT is its straightforward communication of the science that can help us understand the likelihood that a patient will be helped, harmed, or unaffected by a treatment.